This is a book about homeopathy: what it is, how it developed, where it stands today. It is a critical book but not a hatchet job. It is written for people with questioning minds. Anyone who has already adopted a fixed opinion about homeopathy, either for or against, may receive the odd shock. No prior knowledge is assumed but this does not mean that the book is only for beginners. Even if you have read a good deal about homeopathy you will probably find that you view it differently after you have finished. Anthony Campbell is a former consultant physician at The Royal London Homeopathic Hospital, which is the largest of the five NHS homeopathic hospitals in Britain. He is a Fellow of the Faculty of Homeopathy and a former Editor of the British Homeopathic Journal. 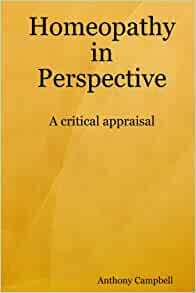 Start reading Homeopathy in Perspective: A Critical Appraisal on your Kindle in under a minute. As you suggested, it is difficult to understand homeopathy without knowing its history. This easily readable (and enjoyable) review of the subject was not technically challenging and well worth the day I took for reading it, as I now know quite a bit about homeopathy, rather than essentially nothing before. While this book is quite informative for the lay person, I also strongly endorse the text for anyone in the health care arena whom might be confronted by patients or practitioners of homeopathy, and in need of a knowledge base from which to respond.